Wild land charity the John Muir Trust has lodged objections to three proposed hydro schemes in Glen Etive near Glencoe, on wild land grounds. The proposed schemes on the south-east side of the Glen Etive Road at Allt Ceitlein, Allt Chaorainn and Allt Mheuran are within the Ben Nevis and Glen Coe National Scenic Area, the Glen Etive and Glen Fyne Special Protection Area and within Wild Land Area 9 Loch Etive Mountains. The proposed developments are part of seven hydro schemes planned for the glen by the same development company. The Trust has stated in its individual objections that each proposed development will also be a contributor to a cumulative impact. John Low, policy officer for the John Muir Trust said: �These hydro schemes would introduce permanent new tracks and related works into the wild land of the Glen Etive mountains. It�s clearly not the right place: the impact on the landscape and its scenic qualities would be significant. 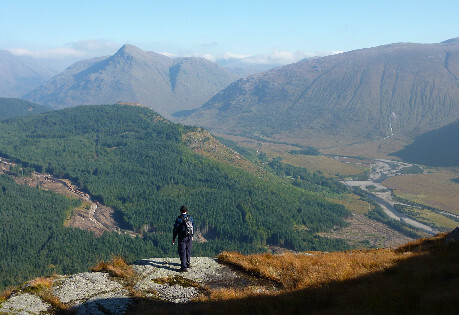 In its objection the Trust has highlighted the potential loss of the wild land characteristics, not only to hillwalkers and mountaineers, but also to visitors and the wider public - highlighting that the experience of grandeur looking at spectacular scenery from the glen road would be vastly diminished. The Trust, which is committed to supporting Scottish and UK Government�s policy principles aimed at reducing greenhouse gas emissions reduction, has also stated in its objections that when combined with the other proposals for small scale hydro schemes in the glen, these schemes will make a negligible contribution to those targets. The Trust�s assessment is that any potential gains being claimed are far outweighed by the loss of this wild land. Mountaineering Scotland has also objected to proposed hydro schemes in Glen Etive, in particular one which would affect the Grampian Club�s popular hut at Inbhirfhaolain. You can also read the Mountaineering Scotland objections to and comments on other Glen Etive proposals here � responses 455, 456 and 457.